The evening of 50 year book coverFriday 12th August 2005 saw a milestone in the life of Rotary in the district, when a gathering of 220 Rotarians, partners and friends celebrated the 50th anniversary of the Rotary Club of Windsor at the Hawkesbury Race Club function centre. 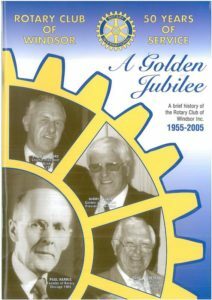 The first Rotary club to be formed in the Hawkesbury, Windsor was sponsored by the Rotary Club of Penrith in 1955, when its charter night was attended by more than 400. Inaugural President was the late Brian Pulsford. Since then the Club has sponsored 2 other clubs, Richmond and Springwood. The gathering was attended by two of the original charter members, John Wiengarth and former Gazette editor, Max Day, as well as many former club members, Rotary District representatives and Rotarians from other Rotary Clubs. The evening was one of fun and laughter, as charter member John Weingarth and former members Dr. John Bain, Geoff Moses and Noel Wenzel reminisced about the early days of Rotary in Windsor, told of projects in which the club had been involved and reminded people of some of the ‘characters’ who had been members over the years. Noel Wenzel’s story of club members’ participation in raft races on the Hawkesbury in the 70s (in the days before insurance became an issue) had the audience in stitches, especially his explanation of an attempt to ‘gain an advantage’ by using a concealed outboard motor on their raft became a disaster “when a great plume of blue smoke issued forth as the motor was started. Needless to say, we were immediately disqualified’. Councillors Diane Finch and Ted Books also spoke. Diane about her experiences as the Club’s first candidate to the Rotary Youth Leadership Awards development program and Ted of how, as a member of the Club in 1985, he instigated the construction of the Stimulus Building in South Windsor. Past President Ross Miller outlined the effort by members to collect and sell mushroom compost, donated by Past President Graham Price from his mushroom farm, with proceeds being used to establish the Rotary Club of Windsor Youth Foundation Trust. The Trust assists the youth of the Hawkesbury in a variety of areas by making a number of grants each year. Applications for the grants close on the 31st August each year. Hawkesbury Mayor, Bart Bassett, outlined how Windsor and other Rotary clubs in the district had contributed to and benefited the community. On behalf of all guests he thanked the club and also made the toast to Rotary and the Windsor Club. The function was thoroughly enjoyed by all and in his closing remarks, President Doug Stoneman announced the night as an outstanding success, saying “he was delighted that so many former members, some travelling long distances, had been able to attend and that this exemplifies the Rotary spirit”. He went on to say, tongue in cheek, ” I hope I will see you all back here for the Club’s centenary celebrations in 2055″.